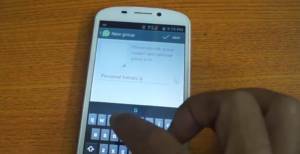 Would you like to create a group chat with your friends on WhatsApp Messenger but you don’t know how to do it? You will find information on here about how to build a group chat. If you would like to chat with your friends in a same window, this feature of WhatsApp will be quite useful for you. You can do these steps for Android, iPhone and Windows Phone. There is only 5 steps to use this feature and you can do it with our step by step guide. Run WhatsApp application on your Android, iPhone or Windows Phone device. Tap on Chats and open your conversations in the app. You will see “New Group” or “Create Group” option of the top of the screen. Please, tap on that. You can add more people to group with tapping on “+” on the application. If you are done with adding people, please tap on “Create” button. That’s all. Now you can chat with your friends in the same window and your friends will able to chat with each other. That is the easiest way to create groups in your device. If you are not using Windows Phone or iPhone or Android, you can apply similar ways on your phone for creating a group. That is all. Having trouble with create group chat on WhatsApp, then see our guideline if you cannot create a group chat on WhatsApp. This is going to help you about resolve your problems. However if you have any other specific issue, please leave a comment below or go to our unofficial support page.